November 2015 – Arduino, Raspberry Pi and ESP8266 Small Computers! The Freaduino MEGA 2650 looks a nice board at first view. 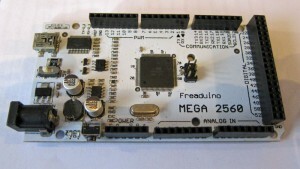 It is advertised as Arduino MEGA 2650 compatible with many extras. Like a switch to run on 3.3V or 5V, which makes it easier to interface to 3.3V devices. And a more capable power circuit when powered by a external powersupply: 800 mA 3.3V,5V 2A. I have bought, a year ago, one of these boards: a 2012 version V1.4, date 22/10/2012. Looks well produced. The dimensions are not exactly identical to the Arduino MEGA2650, prototype boards do not fit. Pinout is identical though. It has a FTDI FT232L based serial interface instead of the ATmega16U2 IC. The FTDI FT232L on my board is a fake, so it becomes bricked when a current FTDI Windows driver detects this IC. In 2014 I did not get it to work, due to the fake FT232L, and put it aside. But today I got it operational again! Alas still not operational on Windows, it works fine on a Linux system such as the Raspberry Pi. All my standalone Arduino’s on one page. Also see the Raspberry Pi connected ‘Duino’s. Each has been tested by compiling and uploading the standard Blink program or a variant. 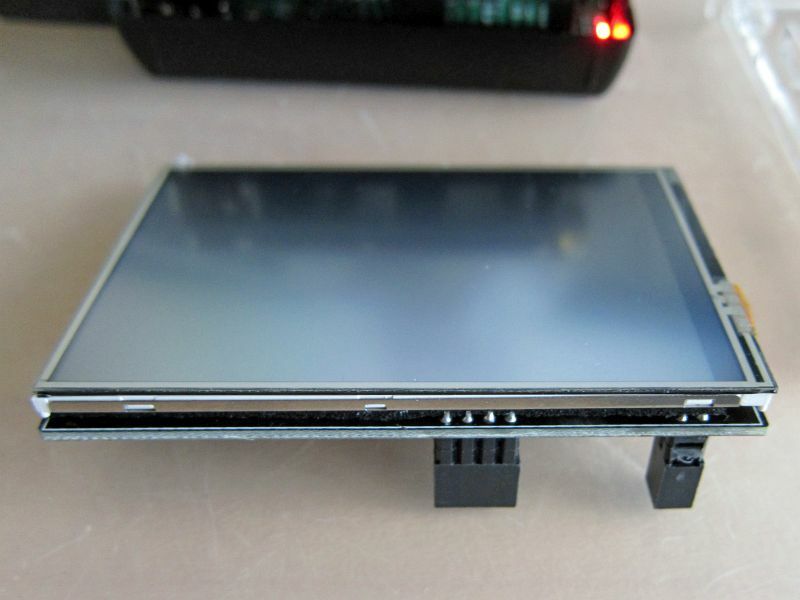 Tested with the Arduino 1.6.5 on Windows 8.1 except the Freaduino tested on the Raspberry Pi! Simple but effective timelapse. Note that raspistill has many more interesting configuration parameters! Based upon notes by James Singleton. The Raspberry Camera Module is a giant success. Flexible, high quality, well supported. I have shown you already tow posts how I use those, RPi Cam Web Interface in Action and Timelapse, more to come! Over the years I have bought several. All seem to be Revison 1.3, one is a clone. Here some photo’s. The combination of Arduino, such as the Uno with the ATmel ATmega 328P, and the Raspberry Pi is a natural one. The RPi is an allround computer with I/O facilities and a general purpose, though not real-time, operating system. The Arduino is a programmable microcomputer with also lots of I/O including lots of digital I/O, analog inputs and PWM outputs, made for running a dedicated program with precise real-time performance. Where bitbanging I/O on the RPi is not such a good idea, on the Arduino on the contrary it is common. Exchange data via the serial ports to let both platforms enhance each other and work together. I have two boards that add an Arduino experience to the Raspberry Pi: the RasPiO® Duino and the GertDuino. Both function well. The RasPiO® Duino is a simpler, better supported, better designed and cheaper solution, though you have to solder it yourself. The GertDuino is ready to run, more powerful, since it has two ATmega IC’s (a replaceable 328 in DIP and a 48) but a bit rough on details. This is my second test of the timelapse/video facilities of a Raspberry Pi with the camera on top.